The chinook is the largest of the Pacific salmon species, the world record standing at 57.27 kilograms (126 pounds). 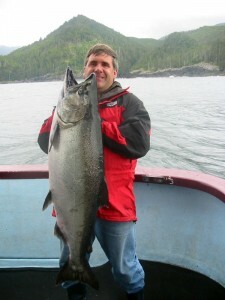 Chinook are also known as “spring” salmon because they return to some rivers earlier than other Pacific salmon species. This species is known as piscivorous, meaning that they eat other fish. A favourite in the recreational fishery, the chinook salmon is known by many names: King, blackmouth, quinnat, and chub are all references to this powerful fish – with those over 14 kilograms (30 pounds) dubbed “Tyee”. Chinook are an unusual Pacific salmon species because the flesh of adults can range in colour from white through pink to deep red. The main spawning area of sockeye salmon extends from the Fraser River to Alaska’s Bristol Bay. Most sockeye in BC and the Yukon spawn in late summer or fall in lake-fed systems; at lake outlets, in lakes, or in streams flowing into lakes. Major spawning runs are found in the Fraser, Skeena, Nass, Stikine, Taku and Alsek watersheds as well as those of the Smith and Rivers inlets. For further identifying information about Pacific Salmon, please visit the DFO website Salmon Facts page.